It's that time of the month, Daring Baker's reveal. This month's was extra special. The May Daring Bakers’ challenge was hosted by Linda of make life sweeter! and Courtney of Coco Cooks. They chose Apple Strudel from the recipe book Kaffeehaus: Exquisite Desserts from the Classic Cafés of Vienna, Budapest and Prague by Rick Rodgers. Now I don't consider myself Austrian, more like half Italian, half Serbian. However, when my mom traced the ancestors many years ago, there were Austrians in the mix. This strudel recipe is eerily similar to what we call pita. Do not think pita bread. Think more of spanakopita from the Greek. Pita when I was growing up was made by my mom and Grandma. We had a pita tablecloth, 100% cotton damask, stained with butter and thin and frayed from years of use. I am the proud owner of it. Today I had my grandma here in spirit as I made this month's challenge. We eat pita at every holiday, but we use boxed phyllo dough, today I made it from scratch. And surprisingly it was easier than it looked 20 years ago. There are a few thousand Daring Baker's out in the blogosphere, so I am not going to reprint their recipe. I will however give you mine. I decided if I was going to make the Daring Baker's strudel, I ought to make it side by side to the family recipe. A few things struck me right away. My grandma's called for Mazola corn oil, which is no longer here, so I used canola oil. She was very brand loyal and I can remember her always using Mazola. Also, her recipe had more oil and flour than the DB recipe. The DB recipe also called for a half teaspoon of cider vinegar, apparently this is to hinder the gluten development. My grandma never used a stand mixer, and I wasn't going to do it without. As usual, today is reveal day, so time is of the essence. It took additional flour to get my grandmas dough to come together, it was very gooey. On the flip side, I had to add another Tablespoon of water to the DB dough as it was very crumbly and raggy. Both doughs rested for about an hour, and in the end, grandma's dough stretched more evenly than the DB dough which felt a little tough. We were free to fill it with what we liked, so for the DB I chose apple filling. With the family dough, I chose cheese filling also known as burek. Traditional burek is made with feta cheese, more like the Greek version. My family's cheese pita is made with cottage cheese, brick cheese (only found in the midwest, sub monterey jack) eggs, butter and maybe a little yellow cheese for color. Both recipes follow. My house smells delightful right now, and I am thrilled to eat pita for breakfast, lunch and dinner for the next few days. So let's compare the finished product. My dough was a larger batch, and I rolled the strudel about 4-5 times in it. I don't think it was hot enough in the oven because it really was doughy after baking and never really got crispy. The DB dough was so crispy it shattered. Hmmmm. It makes me rethink the vinegar, I think I will add it to my Grandma's. I love the way both doughs held in the filling, it sort of stretches with it as it bakes unlike phyllo which tends to split. Both were incredibly delicious, and a true success. However, I will make a few adjustments. I'm using my dough plus ½ teaspoon vinegar. Also, I think I will make 2 rolls with the dough since they are a little hard to pick up when rolled. I can honestly say I will not likely buy frozen phyllo dough again. This was far easier for me. The dough takes a few minutes to put together then rests for an hour. The stretching took all of 10 minutes and I was done. I think of all that time buttering the phyllo layers, this is a much tastier version. I'm so glad I have a Serbian grandma who passed her love of the kitchen to me. I admit this is a project, I am glad I jumped in, the results are delicious. When you make this, turn off the air conditioner, lock the doors and remove watches, bracelets and rings. Get on short sleeves or roll them up good. One draft of cool air will make the dough seize back, you want it to stay relaxed. Also, as you stretch it, you are using the back of your hand so you want to be careful not to have it tear. Mix in bowl of stand mixer with flat beater. Add additional flour until dough becomes smooth and comes together. Replace flat beater with dough hook and mix for about 3 minutes. The dough should come onto the hook. Add more flour if it is too sticky. Remove the dough and place in an oiled bowl, flipping it around so it too is oiled. Cover with a damp towel and let it rest for an hour somewhere warm. Cover a small round or oval table with a cotton cloth and rub flour into the fabric. Roll the dough out as best you can and then begin to use your hands. If you let the edges come over the edge of the table, the weight of the edge will help stretch it. The dough should be paper thin, you can read through it. My grandma would trim the fat edges and re-roll them. Drizzle a little melted butter (salted please) all over the dough. Do not use a brush as it will tear. Place your filling along one long edge and using the tablecloth start to roll the dough into a long log. Tuck the edges in as you roll. Carefully place the roll in buttered pan and bake at 375° for about 15 minutes to brown and then drop heat to 350° and continue to bake for about 30 more minutes. Cool slightly before cutting. Yes, I insist on salted butter. You have to have that contrast of salt with the very plain dough and the sweetness of the apples or the cheese filling. Trust me on this, I have made it with unsalted butter and felt cheated. Enjoy! So after I wrote my tribute to my Mom blog, I got a little hankering for those Chocolate Drop Cookies we made in the day, from the Betty Crocker Cooky Cookbook. This will be a shortie because I have already given the history of my beloved cook book, and the future of it should I pass first. Morbid sister of mine! I do remember these cookies fondly, and funny, but you don't really see drop cookies around much. I do understand a little about baking chemistry, and the shortening is crucial, it keeps the cookies fluffy and soft whereas butter would make them spread out and give them crunch. So as unfashionable as it is, I'm am yanking out the Crisco. The rain seems to have passed, and I can easily whip these up before we head off to graduation parties. The dough comes together easily, although I was a little short on ingredients. I had no unsweetened chocolate, so I used 3 Tablespoons of Pernigotti Cocoa and a Tablespoon of shortening to substitute for each ounce called for. I a was also a little short on sugar (yea, I'm a baker who has no sugar), so I filled the measuring cup with what I had, and added Lyle's Golden Syrup to top it off. Experience tells me that a little corn syrup also keeps things soft, and although Lyle's is cane syrup, same effect, way better taste. And finally, no buttermilk. So again, I punted and used milk soured with lemon juice. The batter got very curdled when I added the sour milk, but came together when the dry ingredients were added. They are a little shaggy and sticky when you put them on the cookie sheet, but they bake into these perfect rounded mounds. We used the recipe for Marie"s Easy Chocolate Icing, but I was a little low on confectioner's sugar, so the frosting was a little thinner than I would like, but we made due. These are cakey cookies, and I enjoyed the cocoa lightness. If I pick a cookbook to cook, this will be it. All those cookie recipes. It's fairly obvious that it is my favorite thing. We'll see what the summer brings! Happy Baking! Mix shortening, sugar, egg and chocolate thoroughly. Stir in buttermilk and vanilla. Sift together flour, soda and salt and blend in. Chill at least an hour. Heat oven to 400° and drop by rounded teaspoonfuls about 2" apart on Silpat or parchment. Bake 8-10 minutes or until they spring back when lightly touched. Do not over bake. Cool on racks before icing them. Melt butter in chocolate in double boiler. Blend in warm water and cream then beat in confectioner's sugar until it is proper spreading consistency. As many of you know, I am a proud member of the Daring Bakers. This month is the first challenge of the Daring Cooks. Same concept, a recipe is revealed in a member's only forum, and then we all cook it and reveal our blogs on the same day. I was delighted to join, and happy to make something that didn't have sugar as its primary ingredient. So here is the first reveal. Ricotta Gnocchi. We have chosen a recipe from the stunning cookbook by Judy Rodgers, named after her restaurant, The Zuni Café Cookbook. On the surface, this is a very straightforward recipe. The challenge is in the forming and handling of the gnocchi. What you do with the recipe, in terms of variations, is up to you. So there's the business part, generally there is a blog checker looking for the tag lines, and if you are a member and don't participate 2 months in a row, you're fired! So here's the deal with my gnocchi. 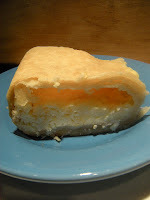 I made and blogged the ricotta a week or so ago. It was delicious and I will be making this often. As Mother's Day approached, I was pretty sure no one was cooking for me, so I decided this would be a good time to make the gnocchi. I actually prepared the gnocchi about 4 days in advance and froze them as was directed in the recipe. The dough is very fragile, and I tested it before I froze it and the cooked gnocchi without sauce was great. I could really taste the fresh nutmeg. Freezing it just for a few days must have taken a little moisture out because they were a little crumbly. I halved the recipe (thank goodness) since I was cooking for 3, and cooked them in 3 batches. The first batch was much better than the last. I boiled them as directed and cooked them in a sauce I made with browned sage butter, fat free half and half and a little tomato paste. The verdict? I love gnocchi, but not these and not mine. I totally stink at this. My gnocchi were seriously deformed, and of course I am comparing them to the gnocchi I would get at a restaurant likely made with potato or flour. When I dropped them in the sauce they were so fragile, and by the last batch it was if they were almost melting into the sauce. Were they not boiled long enough? Was the butter sauce not hot enough? I really have no idea. My conclusion is, been there, done that. Not something I will attempt again. My family was not thrilled. The sauce was delicious and would taste great on whole wheat pasta with some chicken sausage in it. But I think I'll leave the gnocchi for my Italian restaurant adventures. Now I can really appreciate the work that goes into it! As an aside, there were 2 products that really made the sauce and finished product shine. 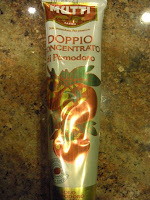 Tomato paste in a tube is super concentrated, tastes incredible and is the ultimate in convenience. It is also so easy to regulate the amount. This is what I used in my browned sage butter. Although I did use fresh grated nutmeg in my gnocchi, even with the sauce there wasn't a big flavor punch. A dusting with salt with truffles was superb. This trendy little salt has itty bitty chunks of truffles and is great on simple pastas. It made this ho-hum dish much more palatable for my family. I am so excited about this month's Daring Baker's Challenge, which will be a real challenge. But that's really the concept behind the groups. Whether baking or cooking, they want us to step outside our comfort zone, step up to a challenge. I love that, I don't have to love what we make, but I love a kitchen adventure. Watch for the baker's reveal in a week or so! What can a grown woman buy her Mom for Mother's Day? Flowers? Perfume? Candy? Well if you thought of any of those, you don't know Jo very well. Jo, as I affectionately call my Mom, just isn't the average mom. Married at 19, she and my Dad have been together 57 years. I am the youngest of 5 kids that are all pretty well adjusted and happily married. Proud grandparents of 11 grandchildren she never misses an occasion to email them, drop them a note or a message on Facebook, yep, she's on. She was an early entrepreneur, and owned a "figure salon" back in the 70's. It was the first generation health club, only women, with belts and rollers and she would lead an exercise class to an album she had. She has always been a volunteer and writer and at the age of 70 she graduated from college with her BA in Creative Writing. These days you are likely to find her volunteering at the Salvador Dali museum in Florida. So how about a tribute blog for Mother's Day? After all, she must be part of the reason I am a devoted writer, a good cook and a good mom. Here's to you Jo. I was a lucky kid growing up in a small Iowa town. My mom was no June Cleaver, but she did do it all. She sewed beautifully and had the most adorable sewing room. It was a small round room in our old English Tudor house. She made clothes for herself, for us kids and for Barbie! Baking in my memory was my mom handing my older sisters and I the Betty Crocker Cooky Book, Copyright 1963, and I still have it. It is taped together, but the stained pages are filled with notes on the recipes we made as a kid. Chocolate Drop Cookies: good, Brown Sugar Drops: good, Pumpkin Cookies: 9/24/76 Excellent, couldn't go skating. I remember that day like yesterday. She told me to clean my room so I could go to the skating party with my class. I crammed everything in my closet, and she found it! I was sooo mad I couldn't go roller skating, it was the one opportunity to hold hands with a boy! So she suggested I make cookies, and I did. Amazingly I soon forgot about the party I missed, and I will never forget that night. It very well may have launched my passion for baking, but it certainly started my journaling. I have never been a devoted journalist. I have tried, especially after the kids were born, to keep a journal. My method is from that night in 1976. Every cookbook I own has handwritten entries when I make the recipes. It could be as simple as the date and my substitutions, or a note about the events of the day. Our Sloppy Joe recipe that my family loves was first made when Nic broke his leg. I have a chicken and apple dish I made for our last dinner party in Michigan before we moved. And of course the many cake recipes I've made for birthdays over the years. My Mom's cookbooks were also filled with letters, photos, notes and invitations. There was no rhyme or reason for where she tucked these, but they were forever encapsulated in her cookbooks. You'll find the same things in mine. In Betty's Cooky Book is a note that declares "if Susie dies before Lori (she's my sister), Lori gets this book". Nice, right? But other books are filled with notes from my kids, hand drawn pictures, postcards, wedding invites, small bits of my life that get tucked in only to be found one day when I am looking for a recipe. My Mom also always put her name in her books. It didn't matter if it was a cookbook, a paperback or a hard bound novel, her distinct signature is on page one. One year she gave me The New Basics Cookbook and wrote me a note on the inside cover. "Grand Rapids, March 18, 1990. To Susie, a great cook, from your teacher. Love, Mom" That book is falling apart at the binding, spilling out hand made cards, Hallmarks, handwritten menus and novenas. I have a brand new copy on hand, but have never used it, there is too much history in that well used book. Christmas Eve Dinner 1995 is found on page 498, Waffles from Easter 1992 on page 452, and in Jan. 1997 we had a snow day in Memphis, it was a Friday and we baked Olive Bread, page 616. In 1992 my Mom must have gotten tired of handwriting the family recipes every time one of us misplaced one. For Christmas that year she gave us all a cookbook called The Kitchen on Market Street. The kitchen in the big old house on the corner of 10th and Market is the setting for this book. This is where my Mom grew up and how she paid tribute to her Mom, but unfortunately Grandma was no longer with us. The book is filled with recipes and stories from her childhood and even from motherhood. So I have decided to honor my Mom, my Grandma and my heritage. I bounced the idea off my sisters, and they are in. Guess what Jo? We are writing our own cookbook as a tribute to you, as a way to document these memories and pass them on to our kids someday. Perhaps it will be ready for Christmas, or Mother's Day 2010. Either way, it will be signed by me (and Lori and Patti) with an inscription for my Mom, dated of course. And I know that eventually my Mom's little notes, cards and letters will find their way into the pages of this book as well. Happy Mother's Day! For a very long time I have wanted to make cheese. Specifically, mozzarella cheese. About 7 years ago we went to Cooperstown, NY for a baseball tourney and on the historic main street was a charming deli that I ventured to every day. The story was that the owner, a young woman in her 30's came to Cooperstown to live her deli dream, and her father came along and he was in charge of the fresh mozzarella that they made right there. That mozzarella haunted me, it was so wonderful. I went on a fact finding mission and found a few possibilities when it came to making my own. The first is a sort of mozzarella curd you start with and basically heat it up and without too much effort you have cheese. No one that I have found in town sells this starter. The more authentic way, which of course is what I want to do, involves rennet and is much more labor intensive. But I have yet to embark on that journey. Today, as the rain seems to never end, I decided to make ricotta cheese. Yes, I am aware you can buy this stuff in the supermarket. However, from everything I have read, nothing compares to home made, and it is so easy it's almost embarrassing. The recipe from Epicurious, my home away from home, is easy and straight forward. 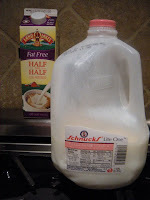 Their recipe calls for whole milk and heavy cream, and because I don't generally follow recipes well, I used skim milk and fat free half and half with great results. I did have a few issues. The first batch I put the lemon juice in with the milk and cream up front. I held on, and once it came to a boil it curdled as it was supposed to. Also, when it came time to drain, I was out of cheesecloth. I first drained the cheese through a sieve and then drained again using a paper coffee filter inside the sieve. For the recipe I intend to use the ricotta for, it is important to get it as dry as possible. Heat milk, cream and salt in large pot and bring slowly to a boil. Add lemon juice and reduce heat to low and simmer, stirring until the mixture curdles, about 2 minutes. Remove from heat, and strain through a sieve into a large bowl. Let the cheese strain for about an hour before chilling. If desired, you can keep the cheese in the sieve in the fridge longer to drain it properly. It is delicious on its own, but I suspect it will make the very best cannoli filling ever, a great lasagna, but also terrific on a toasted bagel. I vow to never buy the supermarket stuff again!